Photo Caption: On July 10, 2017, Working Mother Magazine introduced attendees of the annual Multicultural Women’s National Conference in Manhattan, NY, to designers and mentors from theBROOKLYNfashionincubator (BFI) at Berkeley College. Throughout the day, the designers shared their visions for the future of the fashion industry with high achieving females leading the dialogue about race, culture and gender in the workforce. 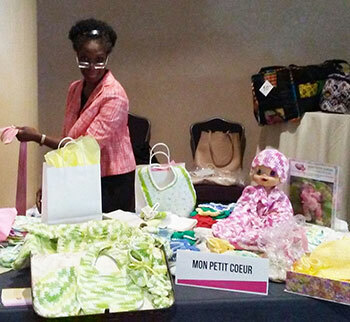 Pictured above, Norine Medas, designer-in-residence from theBROOKLYNfashionincubator at Berkeley College and founder, Mon Petit Coeur, displays her handmade apparel and accessories for children. 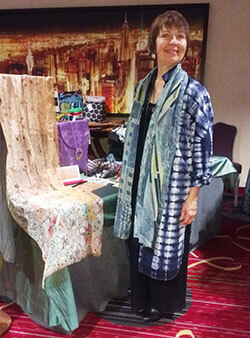 Pictured below, Mary Jaeger, mentor from theBROOKLYNfashionincubator at Berkeley College and textile designer, with her collection of designs. Ms. Jaeger has been commissioned by Working Mother Magazine to design a special scarf for next year’s conference to be raffled for BFI and a to-be-determined charity. Read More: Click here to learn more about the BFI at Berkeley College, and click here to learn more about the incubator’s designers-in-residence.